Do beans actually have flavor? Really? I'm not so sure. Hummus gets it's flavor mainly from the garlic, lemon, olive oil and tahini. Baked beans are sweet from sugar and spices. Mexican black beans get their flavor from savory and smoky herbs and spices. Have you ever heard that tofu is "a blank canvas" and gets it's flavor from whatever you add to it? Well, get this.... tofu is made from soy milk.... which is made from .... soy BEANS!! Beans certainly have a wonderful texture (like in hummus), and they offer an earthiness to dishes as well as the ability to bind different ingredients together (like in an awesome veggie burger). But what they don't have is a lot of flavor. That makes them perfect to load up with your favorite spice blend. You can go sweet, spicy, herby, smoky, whatever you like. Beans are so incredibly healthy, you owe it to yourself to pop open a can and try something new! This recipe works great with my Sweet & Spicy BBQ Rub, but you can mix it up with whatever you are in the mood for. 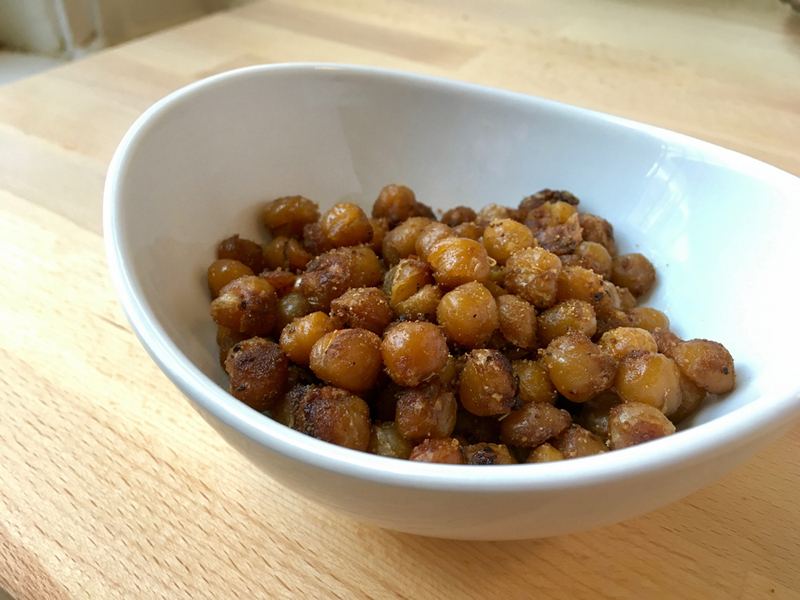 Roasting chickpeas are super easy and delicious. When I was testing this recipe, I found myself mindlessly munching on them, I almost ate the whole batch in one sitting! Add chickpeas to a bowl and coat with olive oil. Add just enough oil to coat the chickpeas. Line baking tray with aluminum foil. Return the chickpeas to the tray (don't was the bowl yet! ), and roast in the oven for about 20-25 minutes, stirring around once or twice during the baking. Return to the oven to roast for another 15-20 minutes, stirring two or three times during the baking. And that's it! Super simple, super versatile, and absolutely delicious! What's your favorite dish using chickpeas?? Let me know in the comments!